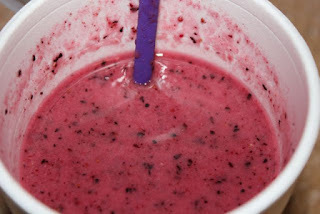 This smoothie takes the cake if you ask me! It’s heavenly! Creamy and full of flavor oh yeah and did I mention about 120 calories OH YEAH! That’s the good stuff. I have gotten to where I have smoothies daily. 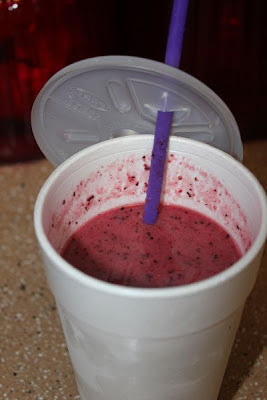 At one time I was buying them from the Smoothie King, but why buy something from them that you can make at home for a percentage of the price, and a percentage of the calories! This size smoothie would be at least $5 at Smoothie King Ouch! The coconut milk doesn’t add any coconut flavor to the smoothie, but what it does add is the creaminess for a fraction of the calories of milk or yogurt. Who can resist that beautiful color anyway? I also like to add a 1/2 tablespoon of flax seeds to mine, but that will certainly increase the calorie count on the smoothie. Before someone asks me about the foam cups. I drink smoothies so much now especially on the way to school that I invested about $30 on 500 cups and lids at Sam's Club. The upfront investment is a lot for cups but it's a great way to take things with you and you get a lot for your money. It beats the $5 at Smoothie King! Add all the ingredients to a blender and blend until smooth. If it’s too thick add more water to thin.